70% of cars are damaged while parked at some point in their useful life. From Mother Nature to the guy who parks too close, there are many ways damage can happen. That’s a real problem, because for many people their car is the second largest investment they have other than their home. Enhance resale and trade in value. That’s a lot of return on investment. We’ve identified the ABSOLUTE best ones to help you make the perfect choice. Fit: Universal car covers vs. Custom fit car covers. Indoor car covers are for garage-parked cars and are designed to protect against dust and scratches. Outdoor car covers protect against the elements like rain and snow. Universal car covers are almost always 50%-80% cheaper, BUT you have to search hard to find the best quality. Custom fit are the top of the line in terms of craftsmanship, quality of fabrics and of course, fit. If you have no experience with covers, we strongly recommend reading our Definitive Car Cover Buying Guide. It’s the most comprehensive resource on the internet. Because universal car covers are made for a mass market price point, finding a good one can be challenging. You can count the number of good ones on one hand. We’ve researched all the major manufacturers, and here are the best of 2019. 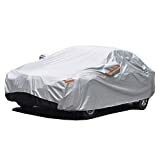 Very few universal car covers get good reviews. The OxGord is a huge exception. Why is it our Best Universal Car Cover? Tough materials; top notch moisture resistance for rain and snow; really soft inner lining won't scratch paint; 6 size options for cars (vs. the more common 4) which increases the likelihood of fitting your car well; a price that is hard to beat. Not as tight-fitting as a custom fit car cover; the extra thickness, while great for rain and snow, does not breathe as well as a lighter cover; if humidity and condensation are issues, consider a lighter cover. 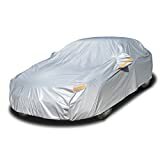 This is a heavy duty car cover that offers excellent protection against rain, snow and dust. 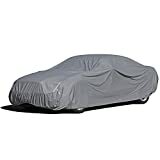 It is one of the best car covers for outdoor storage short of an ultra-premium custom product. The outer layer is treated with a UV inhibitor that reflects the sun and prevents the material from deteriorating. What I really like is that OxGord offers 6 size options for cars ranging from 144 inches to 229 inches. Many budget covers offer 4 size options across that range. This greatly increases the odds of a good fit, and poor fit is by far, customers’ single biggest complaint with budget car covers. Both the front and rear have elastic hems. Add in a strap and grommet tie down system, and all this makes for a far better fit than most universal covers can offer. Great price, solid quality fabric, and a snug fit….the OxGord is deserving of our Best Overall ranking among universal outdoor car covers. The Kayme is a well established best seller with over 300 published reviews and counting. Why is it a Best Seller? Sub-$60 price point regardless of size; a zipper that allows driver side entrance without taking the entire cover off; aluminum layer for UV protection; included mirror pockets and reflective safety stickers. Cotton inner layer to prevent scratches to car paint. Mirror pockets are a nice touch. Installation with mirror pockets is somewhat different. Start by putting the mirrors in the mirror pockets, then cover the front of the car next and lastly secure over the back bumper. Installation should only take 1-2 minutes after a little practice. With solid performance at a great price, the Kayme should get a serious look from anyone on a budget, especially those living in moderate climates. Sub-$60 price point regardless of size; color coding on the front makes installation easier; included mirror pockets and reflective safety stickers. Only 2 SEDAN size options makes getting a good fit more challenging; similar durability to the Kayme vis-a-vis premium covers. The GUNHYI is made out of the same material as the Kayme. The main differences are design related and the number of size options. The GUNHYI has a large black strip on the front to make installation easier. Given the size of these covers, it can be hard to tell the front from the back. It also does NOT have a zipper to get access to the driver side door. All in all, this is another solid cover at a great price. “Breathe” so that condensation evaporates and mildew does not have a place to grow. The Budge Soft Stretch is one of the few quality indoor universal covers available. Fortunately, it is a fantastic product. Why is it a Best Overall (Indoor)? Luxurious feel with a soft fleece inner lining that will not scratch paint; top notch dust protection; 5 size and 3 color choices (red, gray or black); the Soft Stretch has been on the market a long time and gets great reviews; it is simply the best universal indoor available today. $150+ price point depending on size and color; no mirror pockets like a custom fit model; must carefully measure your car to get the right fit especially if you have spoilers or hood vents. Breathability or condensation protection (4 out of 5). All of that equates to better than good indoor protection. The primary material is “stretchy” and has been compared to swimsuits or other athletic gear. It is thick enough to prevent scratches or dings from moderate accidents (e.g., a dog jumping on your car or a rake falling over and striking the fender). The stretchiness does have another advantage…a tight fit. This is important since it prevents dust or other debris from from getting between the car and car cover. Because it conforms to the shape of your car and has an elastic hem, fit is not the problem it is with most universal car covers. So for we’ve been focused on external threats to your car’s paint, such as dust, dogs and gardening tools. There is another threat – the car cover itself. With 5 different size and 3 colors available, there is something for almost everyone. It will fit cars up to 22 feet long. Almost all cars today are less than 17 feet, which is why the Soft Stretch is a favorite of classic car owners with extra-long, vintage Caddies and Lincolns. As with all universal covers, the Soft Stretch will fit some models tighter or looser. The problematic ones are cars that fall right on the border between two sizes (e.g., Soft Stretch Size 2 and Size 3). This issue comes up relatively frequently. If you are unsure, always email the manufacturer before purchasing. Choice of color is mainly about style for an indoor car cover. With outdoor covers, color has functional implications as light colors with reflective colors properties perform better in areas with intense sunlight and UV radiation. For this particular car cover, just pick the color that tickles your fancy. The Soft Stretch is a great cover to protect your car indoors when parked. With a 2 year warranty and a 30 day return window, it’s hard to go wrong. Car owners rave about custom fit car covers. They are among the most well received products in entire the car care segment. Here are our picks for the best of 2019, ranging from $100 to $300+. If you need the absolute best car covers for outdoor storage, custom fit is the way to go. The Coverking Autobody Armor’s name says it all. It provides top-of-the line protection. A true custom fit cover, it is designed to tightly contour to your specific make and year model. Tailored mirror and antenna pockets add to the custom fit. The Autobody Armor is made from three layers of highly durable fabric, each with a different purpose. The outer layer is woven polyester and is excellent at repelling debris and pollutants. The middle layer is polyurethane and is designed for strong moisture resistance. Lastly, a soft inner lining protects your car’s finish and clear coat. Breathability (i.e., allowing moisture trapped under the cover to evaporate) is very good but not best in class. The way it’s constructed screams quality. Coverking uses the minimum number of seams possible, coupled with double stitching and heavy wax-coated threads to increase moisture resistance. We say “moisture resistance,” as no breathable cover is truly waterproof. That said, the Armor is about as good as it gets. Note: even though we label this as a ‘max protect’ cover, even the best traditional car covers cannot prevent damage from serious hailstorms. Specialized hail protection systems offer the only reliable protection for cars parked outside. With a Coverking’s typical 30 day return policy and a 5 year warranty, the Autobody Armor is an excellent choice for anyone that is serious about protecting their car. Anyone who wants the best protection and isn’t worried about cost. Sun, and specifically ultraviolet (UV) radiation, can harm your car in a few different ways. First, with enough exposure, UV rays will fade and oxidize paint even with all the advances in modern paint technology. Modern paint is MUCH more durable than in the past but is also far from indestructible. Secondly, sun also damages car dashboards, steering wheels and other interior parts which are much less resilient than car paint. Lastly, sun and extreme heat can make other risks like bird poop more damaging. Heat causes clear coat to soften and absorb or “wrap around” debris effectively sealing it into the paint. The best sun protection car covers have highly reflective polyester or acrylic fibers in the outer layer. These reflect light and help keep cars cool. The Coverking Silverguard is one of the best UV covers on the market. It comes in two models, the Silverguard and the Silverguard Plus. They perform similarly in terms of UV protection. The Plus model has more reflective properties and a softer inner lining for a $50-$80 premium in price. The Silverguard is a custom fit model. This means you provide the brand, model and year of your car when ordering, and the manufacturer tailors the car cover to fit perfectly including custom fit antenna and mirror pockets. The outer material is a very tried and true fabric, Denier 300 polyester, that is treated for water resistance and is also breathable. The manufacturing is excellent with double-needle overlapping seams and wax- coated threading for leak-resistant seams. Like the Autobody Armor, it is made with as few seams as possible. This makes the cover last longer as tears more frequently occur on the seams. Like most premium covers, the Silverguard has elastic hems in the front and back to ensure a tight fit. It also comes with grommets (or eyelets) on the side so that the cover can be secured even more tightly with cables and locks. The Silverguard has guarantees and service truly befitting a premium cover. It comes with a 30 day return policy, a 3 year warranty and lifetime factory repairs (note: there is a fee after the warranty expires). If you live in the South or Sun Belt, the Silverguard is a great all around outdoor cover that provides max UV protection. The Carscover Ultrashield offers 5-layers of protection making it an excellent choice for rain and dust protection. The five layers include a fleece lining for excellent softness. This is a custom fit cover with elastic hems in the front and back. To ensure an ultra-snug fit side grommets (eyelets) and a strap and buckle system are also included. This helps secure the cover so it won’t blow off in windy conditions. Ultrasonically welded seams and a UV stabilizing agent called “Remafin” really increase the long-term durability of this car cover. Not surprisingly, it has a limited lifetime warranty (reading the legalese is, of course, always recommended). Overall, the Ultrashield is a very good performer at an even better price point. It should definitely be on your short list. If you hit a car with enough force, it will get dinged. That’s simple high school physics. However, a good car cover can prevent many, if not most, everyday dings. The most important features are the thickness of the cover, the number of layers of material and the quality of the materials. One of the best car covers on the market for protecting against dings is the Covercraft Evolution Car Cover. It is custom fit car cover made out of 4-layers of Kimberly Clark’s premium Evolution fabric. The outer layer is polypropylene fibers bonded with a non-woven finish. The inner layer is soft, bi-component poly blend. Breathability is good, but as with most heavy, multi-layer covers, it’s a notch below best in class. Construction is what you would expect from a premium manufacturer like Covercraft. Overlapping, double-stitched seams are standard as are reinforced side grommets. It comes in three different colors and a standard 4-year warranty. The Covercraft Evolution is a great outdoor car cover. If you live in a sunny area and are at risk of having your car dinged, the Evolution is a smart choice. Car covers come in many different varieties. For a thorough grounding, check out our Definitive Car Cover Buying Guide. There are lighter, easy-to-install covers for people who keep their cars garaged full time. Their primary goal is to prevent dust buildup and accidental scratches. For those that leave their cars outdoors for extended periods of time, heavier, multi-layered car covers are a must. How snugly a car cover fits is important. Loose covers create many problems problems. One of the biggest is that they allow dirt and debris to get underneath the covers and onto the paint. Also, with any kind of wind loose-fitting covers rub or “flap” against the paint potentially damaging the outer clear coat. Custom fit covers are designed for specific makes and model and contour precisely to fit mirrors, antennae, etc. Universal car covers, on the other hand, are made to fit a wide range of makes and models. They may or may not fit your particular car well. Their biggest selling point is a much lower price, which is important. Another consideration is quality of material. Manufacturers use many different kinds of polypropylene, polyethylene, nylon and synthetic covers. Performance profiles will vary, so be sure to read up on the individual characteristics. Some are great at repelling moisture, others at reflecting UV rays, and some are good at everything. The other aspect of material quality is the number of layers (usually ranging from 1 to 7). Having more layers means more protection. An indoor car cover can get by with 1-3 layers. A long-term, outdoor car cover used in harsh environments needs max layers and max protection. More layers also “thicken” covers and provide better dent protection. Another very important feature to evaluate is the softness of the inner lining. You want something that is non-abrasive and will not scratch your paint. Budget covers often have polypropylene liners which are acceptable, but not the best for premium paint jobs. Poly-cotton liners are very good, and nylon fleece and especially, cotton are top of the range. The last feature to look for is “breathability.” Car covers made out of woven fibers allow cars to “breathe” and let any moisture underneath the cover to evaporate. This prevents the formation of mildew and corrosion. Covers with more layers will be less breathable than those with fewer layers. It’s a tradeoff. Choosing the best car cover in a highly saturated market is not easy. There are hundreds of products making it difficult for anyone but the most fervent aficionados to choose well. At the highest level, drivers should ask themselves two questions. What is the climate like where I live? And, how do I use my car? The big climate factors are sun/ultra-violet radiation, rain, snow, wind, hail, dust and salty ocean air. Think about which of these are most prevalent in your climate. Then it’s a simple matter of matching a cover’s protection profile to your car’s risk profile . Many manufacturers will have sun ratings, snow ratings, et cetera to help you in this process. How you use your car is the other important consideration. We’ve talked about indoor versus outdoor. If you travel frequently and park for short periods of time, get a light cover that is easy to install. If you leave your car parked outdoors for long periods of time, a heavy, multi-layered cover is needed. You may also want a zippered, easy access panel to get into to the car without removing the full cover. There are car covers to fit virtually every need. Finding the perfect one just takes a small amount of research and knowledge. Once you get used to it, everything becomes second nature. It’s not all that different from a bed sheet. The first time will probably take 5 minutes (assuming you don’t have to install antenna patches). After a few tries, most people can do it in 1-2 minutes. Start at the front and unroll the cover front to back and side to side. Align the mirror pockets. Tuck the elastic hem under the front bumper. Pull tight and do the same at the rear bumper. Take a walk around and snug up any loose corners as needed. That’s it. Here’s a great video from Covercraft. Here’s the deal. You can count the number of great UNIVERSAL car covers on one hand. If you are on a budget, the OxGord, Kayme and GUNHYI offer excellent value for the money. They won’t last as long as $300 ultra-premium, custom fit model. That said, you can buy six of them for the price of a premium model. The best car covers are, without a doubt, custom fit models. They are made of state of the art materials and fit like a glove. If you are willing to pay the extra cost, you can be confident that your car is well protected. Can I use an outdoor car cover indoors? Yes. They are not as easy to install in a confined space, because outdoor car covers are bulkier. Also, make sure they have a good quality inner lining. Cars parked indoors are more likely to get leaned on or have things set on them. A poor quality inner lining can scratch paint if pressure is applied. Can I use an indoor car cover outdoors? Absolutely not. Indoor car covers are made to protect against dust and scratches. They have no UV inhibitors and minimal moisture resistance. Not only would they not protect your car, they would wear out very quickly as the fabric would deteriorate. 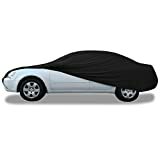 Is it worth the money to buy a premium, custom fit car cover? Obviously, this depends on your financial situation. If your budget is only $5o, then no. However, we believe that investing in a good quality, custom fit car cover is worth it. This is especially true if you have a new car or are a collector. No, and they should not be. Too many companies use the term “waterproof” instead of the more correct term, “moisture resistant.” Any heavy enough rain will penetrate a car cover, even one with 5 to 7 layers of fabric. Now, not much moisture will penetrate but some will. When it does, the car cover needs to be able to “breathe” so that any internal moisture can evaporate before mold or mildew forms. Do car covers protect against hail? Some manufacturers claim that they do, but the answer is “no.” Hailstones can range from pea sized to larger than a golf ball. Predicting the exact size is next to impossible. A thick car cover provides some protection of course, but not COMPLETE protection. If you live in “hail alley,” a sweeping arc from Montana to Texas to the upper Southeast, you may want to consider a specialized hail protection system. Check out our detailed assessment of the risks and protection options. How long should I expect my car cover to last? It depends. Do you use it every day or just occasionally? Do you live in a harsh climate? Do you routinely clean your cover? All that said, getting 2-3 years out of budget covers and 5+ years out of premium car covers is reasonable. We always recommend strapping your cover down, although it is less critical on calm, sunny days. When it’s windy, it is not unheard of for non-strapped covers to blow off. Also, the tighter a cover is, the less likely abrasive dust and dirt are get underneath the cover and scratch paint. Can the car covers be installed while the car is hot? They are made out of non flammable materials and many have heat-resistant material where they touch tail pipes. However, it is better to wait until the car has cooled if you have time.